The MacBook Air offers the perfect combination of performance and portability. 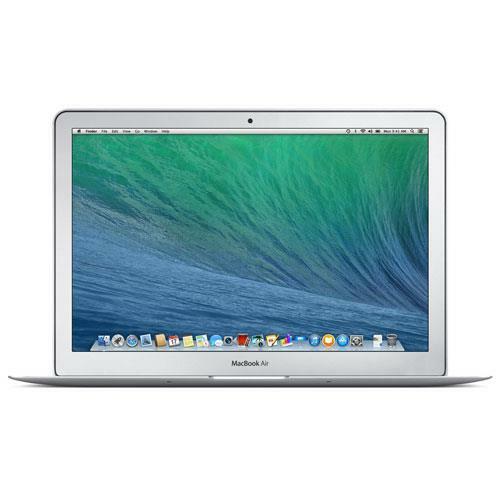 The MacBook Air is one of the fastest laptops from Apple, thanks to the latest processors and advanced flash storage. And since it’s less than an inch think and weighs just 2.38 pounds, you can comfortably carry the 13.3 inch MacBook Air with you wherever you go. The MacBook Air is definitely built for speed, with an Intel Core i7 processor, 8GB of RAM, and Intel HD Graphics 5000. All these advanced components incredibly responsive from the moment you flip the lid open. You can multitask and simultaneously run memory-intensive applications without slowing down. The Intel HD Graphics 5000 processor provides 40% faster graphics performance, so this MacBook is perfectly capable of handling the latest games and running the most processing-intensive creative software. The MacBook Air also features some of the fastest storage devices today; this notebook’s flash storage is up to nine times faster than the traditional notebook hard drive. On the MacBook Air 512GB, you can access your files more quickly, no matter how large they are. The MacBook Air enables faster connectivity, too. Bluetooth 4.0 makes file sharing more convenient, while 802.11n WiFi makes for smooth, hassle-free Web browsing. Thunderbolt and USB 3.0 I/O ports greatly speed up file transfers to external devices, making backups easier. The same I/O connectivity options are also available on other Mac laptops, including the Apple 15.4 MacBook Pro with Retina display.